Will be with a smile that will welcome you by the Owners and staff of Zenith Hotel, ensuring you courtesy and hospitality so that you don�t feel too far from your own house. Zenith Hotel is in the center of Montecatini Terme, �the beating hearth of Tuscany�, famous all over the world thanks to his Thermal Spas. 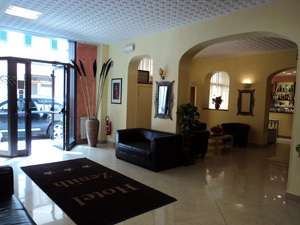 Very comfortable rooms and typical Tuscan cuisine supervised by our chef, who has expertise, experience and passion in its characteristics, make of Zenith Hotel the ideal location both for a short stay in Tuscany and for a leisure and relaxing holiday. Zenith Hotel is able to accommodate both individual guests that groups.